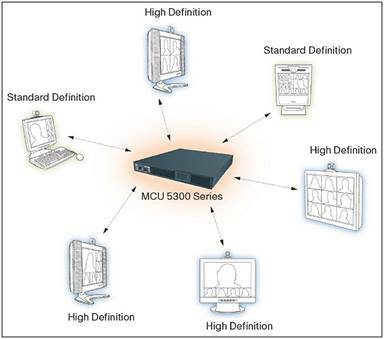 Cisco TelePresence MCU 5300 Series is a range of state-of-the-art multipoint control units (MCUs) that can grow with your business’ video usage over the long term (Figures 1 and 2). As the industry’s first stackable MCU, it provides an entry-level appliance and flexible port that enables your video deployment to grow as your telepresence usage accelerates. Compatible with all major vendors’ standard- and high-definition (SD and HD, respectively) endpoints, it delivers the best experience for each participant, every time. Table 1 summarizes the key features of the Cisco TelePresence MCU 5300 Series, and Table 2 gives information about the models in the Cisco TelePresence MCU 5300 Series. ● Cisco ClearPath is supported, providing improved media resilience with lossy networks. ● The product is standards-based and compatible with all major vendors’ endpoints. ● HD and SD can be combined within the same conference. ● All calls are automatically transcoded and transrated for audio and video. ● Any bandwidth, any resolution, any video, or any audio codec can be used on any video call within the same conference. ● All participants have their own personal encodes. ● The MCU offers custom interactive voice response (IVR))/Auto-Attendant audio prompts and video titles. ● The MCU provides unicode conference and site names for on-screen display. ● The MCU provides custom web interface welcome messages. ● You can configure, control, and monitor the system and conferences. ● You can dial in or dial out through web server. ● You can use the MCU standalone or with an H.323 gatekeeper or SIP registrar or proxy. ● The MCU offers a configurable audio and video Auto-Attendant. ● Advanced continuous presence is standard on all ports. ● Selection of the best layout is automatic. ● You can select individual layouts using remote control or webpages. ● More than 50 custom layouts are available. ● You can select the active speaker using remote control or voice activation. ● You can make floor assignments through the webpage or management application. ● Far-end camera control tunneling is performed using remote control or the webpage. ● Sites are identified through text overlays. ● On-screen text messaging to individual or all sites is possible. ● Conference scheduling and reservation is built into the MCU application. ● You can have both on-demand and ad-hoc conferences. ● The MCU offers an automatic lecture mode. ● You can preview the conference and individual cameras on webpages. ● Connections to audio conferences can be automatic. ● Integration with Cisco Unified Communications Manager v8.6 or later ad-hoc conferencing features allows Cisco video IP phones to initiate impromptu multiparty calls with other Cisco TelePresence endpoints. ● Dual video is available using H.239 or Binary Floor Control Protocol (BFCP). ● Content handover can be automatic or co-operative. ● Widescreen (16:9) is supported as well as 4:3 aspect ratio content. ● Options for content pass-through maximize capacity. ● Options for content transcoding maximize interoperability. ● Participants with no content support can receive transcoded content in the main video. ● Up to 1080p, 30 fps and 720p, 60 fps H.264 4-Mbps continuous presence. ● HD audio is comprehensive. ● Dual video H.239 up to 1080p. ● English is standard, with the option to load alternative language packs onto the system.